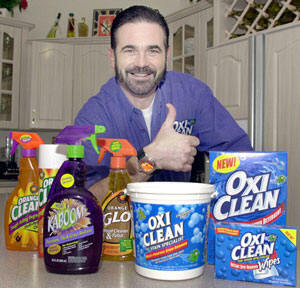 Billy Mays known for shouting OxiClean ads on TV was pronounced dead at 7:45 a.m. Tampa police Lt. Brian Dugan said the Hillsborough County medical examiner will perform an autopsy. 50 year old Mays was a passenger on US Airways flight 1241 from Philadelphia, Pennsylvania, to Tampa International Airport on Saturday when at 6:30 PM the Boeing 737 had a hard landing when the plane's front tire blew out. US Airways reported no injuries. The jet was carrying 138 passengers and five crew members. The Boeing 737 remained at the end of north-south runway 18R-36L for over two hours. According to a local Tampa TV station, Mays had reported "All of a sudden as we hit you know it was just the hardest hit, all the things from the ceiling started dropping. It hit me on the head, but I got a hard head." Airline spokesman Jim Olson stated "We were very sad to learn of Billy Mays' passing and our thoughts and prayers go out to his family,"
Olson said. Tampa officials say the Medical Examiner's Office is expects to complete an autopsy sometime today. In a statement, Deborah Mays said that although "Billy lived a public life," the family does not plan immediate public statements about his death. Mays was a spokesman for Orange Glo and detergent OxiClean and appeared in commercials for other products. He was also featured on the reality TV show ''Pitchmen'' on the Discovery Channel.